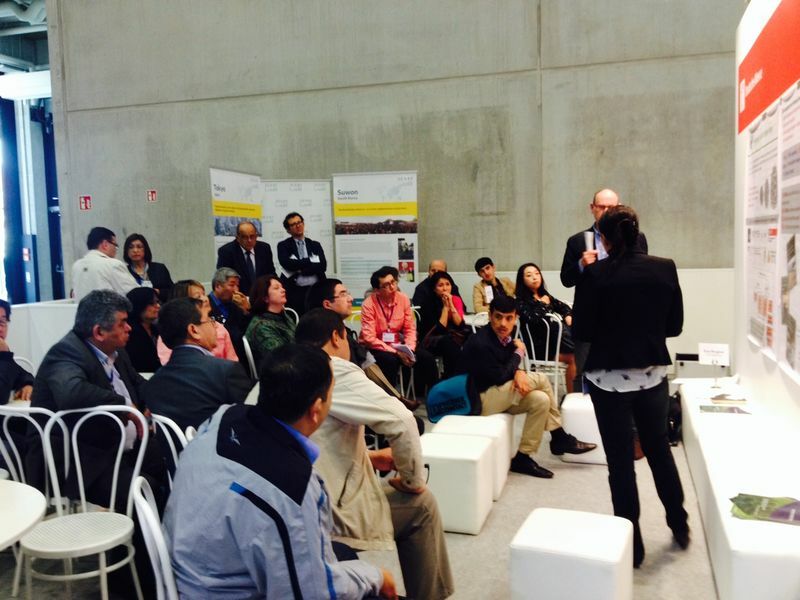 At the final day of ICLEI’s Lounge Talks, experts on finance presented to a large Central Asian Delegation. Eva Ringhof of GIZ Philippines spoke on issues around investing in Asian’s urban future, pointing out that over the next 20 years, Asian cities must be ready to provide infrastructure and services to an expected 1 billion additional people. Amy Leung of the Asian Development Bank and Klaus Gihr of KfW Development Bank both highlighted the current shortfall in infrastructure investment: $100 billion per year will be required, and currently only $40 billion is being delivered. New finance models will be needed to address this shortfall, but cities and local governments must work hard to develop bankable projects and to become sound investment prospects. In the Smart Cities session, Pablo Vazquez Muniz from the City of A Coruna showed how, rather than beginning with top-down solutions for energy or waste management, his city is building a horizontal platform of sensors – a “city brain” – whose data is centralized and made available to management and citizens. City management areas are then integrated around this. Following this, Martin Wattenbach of the German Research Center for Geosciences presented the CityGML, which is a digital, interactive, online representation of cities. However, the representation is not just visual; it displays information on the buildings and structures. Users are therefore able to find out, for example, the greenhouse gas emissions of the building, how old it is, or the total area of its windows. More and more data is being added to the CityGML, including data from the carbonn Climate Registry – the world’s leading platform for city greenhouse gas emissions reporting. In the Lounge Talk that followed, participants debated the definition of a smart city. Pietro Elisei of ISOCARP commented that “Smart cities are a big occasion to rethink, redesign, maybe even rebrand our tools” but wondered whether the concept of smart cities was connected to tangible changes in urban infrastructure. In response, Gulnara Roll of the UN Economic Commission for Europe stated that “When you change the way ministers work with each other, you get new infrastructure”, and that this was a different way of looking at smartness in relation to cities. Binee: a trash can that is able to talk via an app to the user and give points or money for recycling correctly. Bat Sharing: an app that shows what shared transport options are available for a given trip. This incorporates car sharing, ride sharing, bike sharing and other schemes, along with providers like Uber. Breeze: a miniature air quality monitoring device. Significantly smaller than all previous monitoring devices, Breeze will allow companies and cities to monitor air quality in a comprehensive fashion, by installing the miniature devices in many locations. SunnyRev: a “solar as a service” business model. Rather than installing panels themselves, municipalities, businesses and residents can invite companies to install panels and sell the energy to the user. The vision is that of having every building produce its own energy.